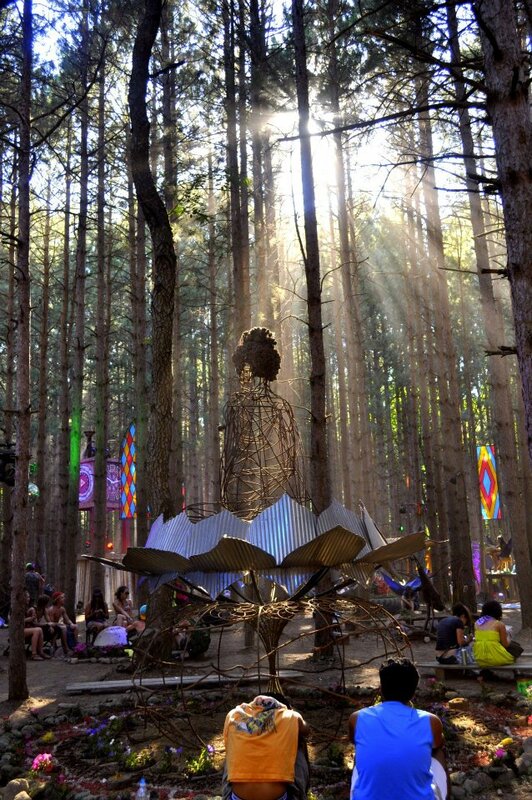 This festival season, Electric Forest returns to the Double JJ Ranch in Rothbury, Michigan on June 27- June 30, 2013. Today, Electric Forest's "Plug In" Program - the festival's innovative fan engagement platform - is in full swing. With many unique participation opportunities and several winners already announced, thousands of Electric Forest fans have been showing off - and sharing - their creativity, talent, and loyalty to the fest. Check out these stories submitted for the "Electric Moment" contest, the winners for Timeline Photo contest and Instrumental Forester competition, and the top submissions for the ongoing Chari-T Shirt Design contest. Visit electricforestfestival.com for details on all of the Plug In opportunities, including the hugely popular Hoop Troupe contest launching tomorrow (Wednesday March 27). Additional contests still to be announced. Known for fully embracing the possibilities of an engaged festival community, Electric Forest's Plug In Program deliberately blurs the line between event organizers and attendees. With this truly unique "open source" approach, the festival is able to harness the creativity and passion of its community members, offering real and tangible ways for fans to participate in and ultimately help shape the Electric Forest experience. This is a big deal, since for Electric Forest – experience trumps all. Recently chosen as one of "the world's ten best music festivals" by Jetsetter, Electric Forest is widely recognized for propelling the U.S. festival scene into a brave new era of music and camping festivals. Hailed for its deep, diverse, and often unexpected lineup curation, Electric Forest 2013 features performances by live music pioneers The String Cheese Incident (3 performances), Pretty Lights, Passion Pit, Empire of the Sun, Knife Party, Dispatch, Benny Benassi, Yeasayer, A-Trak, Grimes, Railroad Earth, Trombone Shorty & Orleans Avenue, FEMI KUTI & The Positive Force, Madeon, Headhunterz, Baauer, Danny Brown, Greensky Bluegrass and many more. The complete list of currently confirmed performers is available at www.electricforestfestival.com, with additional artists still to be announced. At the heart of Electric Forest, the beloved Sherwood Forest is "with no exaggeration at all, the most well produced and artistically inspired area…ever seen at a music festival" (Magnetic Magazine). Showered with state-of-the-art, jaw-dropping light displays, intricate and earthy artful touches, and everything in between, in 2013 the Sherwood Forest is expanding in size for the first time ever. Fans can look forward to more to discover, wonder and wow. Also in 2013, Electric Forest's unrivaled GOOD LIFE VIP experience promises even more stellar amenities and perks. From camping and RV spots, to log cabins and homes, to resort hotel-style suites – all located directly on the festival grounds – The GOOD LIFE has something for all budgets and tastes. The festival's exclusive site - hailed as "THE best place to hold a music festival" (Magnetic Magazine) - offers trails, forests, fields, lakes and beachfronts, and even on-site bars and eateries. In addition, Electric Forest patrons can take advantage of the resort's many amenities including a 60,000 square foot indoor water park, an 18-hole championship golf course, swimming pools, horseback riding, and more. Visit www.electricforestfestival.com for GOOD LIFE options and details.